Pieces of the trees cut down at Denver’s City Park golf course are now being used for elementary education through a community art project. 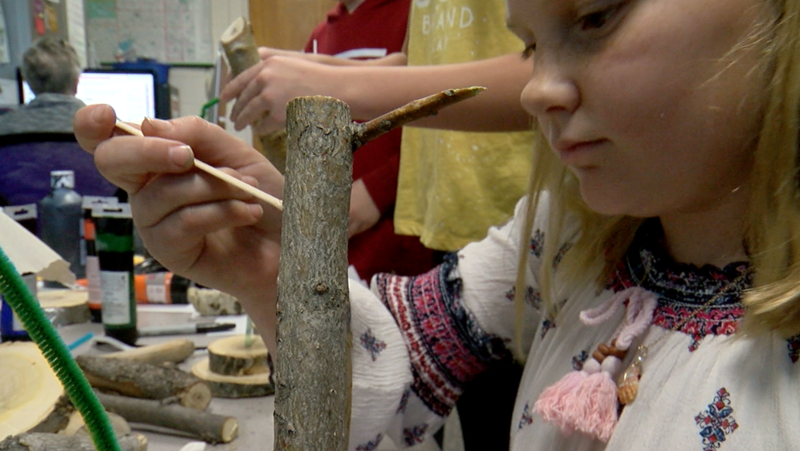 DENVER — Pieces of the trees cut down at Denver’s City Park golf course are now being used for elementary education through a community art project. Around 250 trees were removed as part of a drainage project and course renovation. Some community members fought against their removal , ultimately to lose out. “Because of that controversy I was trying to figure out a way, how do we re-purpose and make this a win win situation?” local artist Darrell Anderson said. Anderson lives in the neighborhood near the park. He went to several of the meetings, and saw the trees being cut down. He decided to try to turn that into a positive outcome. “The contractors were generous enough to cut me pieces of wood that I’m taking to schools,” he explained. Through a partnership with the Cherry Arts nonprofit, he now travels to various community schools, bringing cut disks of wood or pieces of branches, and helps students turn them into a piece of art. It's called "The Art of Community." He’s been to a few schools so far, with plenty more on the calendar. “I would like to hang out in the past but it’s gone, and the future’s not here. These guys are present making things happen,” he explained. Students glue pieces of wood together, paint them, add beads and pipe cleaners. Anderson says helping them express themselves using these unique materials is turning the tree situation into a net positive. Anderson and Cherry Arts are in need of some support to keep their project going. They’ve set up a GoFundMe to help pay for supplies .